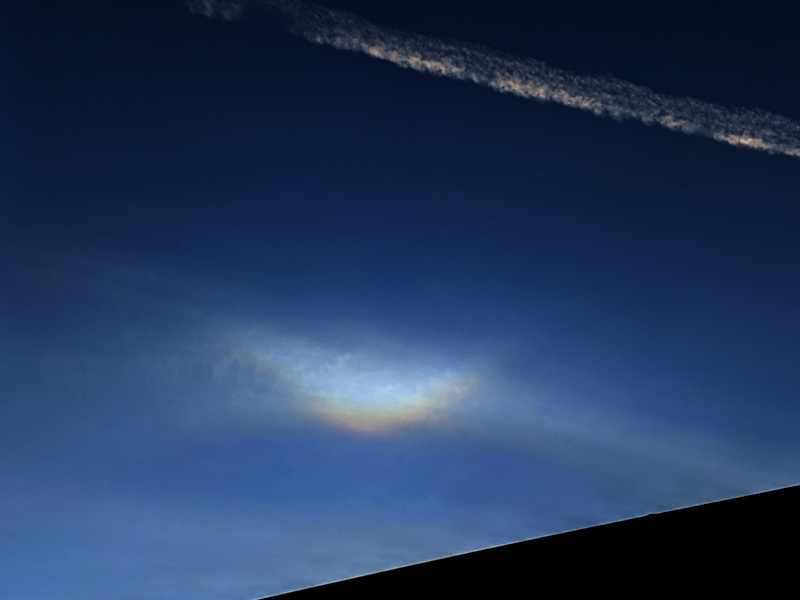 When I first started paying attention to solar ice halos, I read about tangent arcs. But this is the first time I’m sure I’ve seen one. The tangent arcs appear above and below the sun, branching out from the 22° circular halo (which you can see here, very faintly), and change shape depending on how high the sun is in the sky. It was late afternoon, and the sun was behind the next building over. I ended up snapping a shot with my phone, wishing I could have grabbed a better camera, but the Pixel 2 caught a surprising amount of detail once I adjusted the brightness to bring it out. (No, the sky wasn’t this dark!). It’s a far cry from the G1’s photo of a very blue (and blurry) set of halos 10 years ago, or even the Galaxy S4’s colorless rainbows at sunset four years ago. 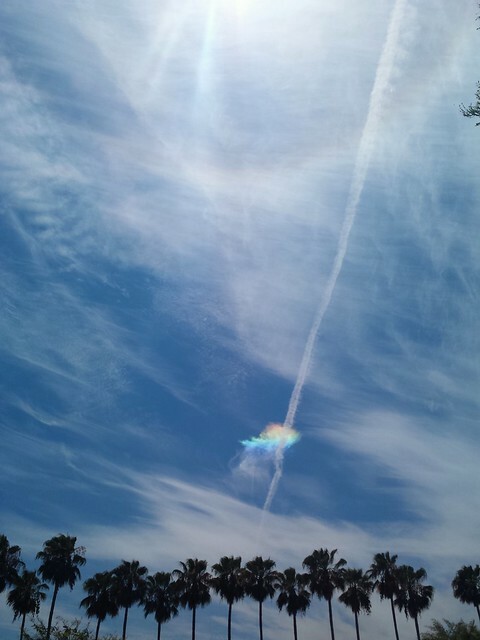 This entry was posted in Photos and tagged halo, sky, tangent arc on January 19, 2019 by Kelson. 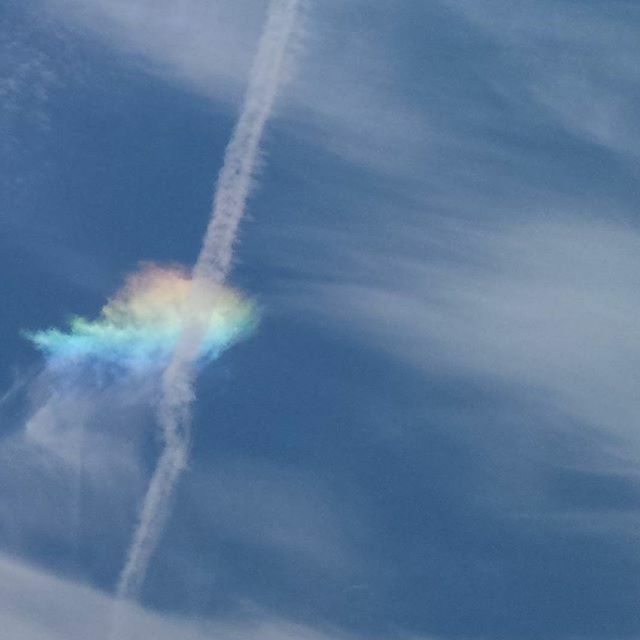 You may never seen a halo around the sun or a sundog next to it, but they’re actually quite common. You just have to look up. (Just don’t stare at the sun!) I usually keep an eye out for sun halos whenever there’s a thin cloud layer, since there usually aren’t ice crystals near the ground in LA, but the upper atmosphere is a lot colder. I actually wasn’t looking for this halo. I just happened to look up toward the tree across the street and *wham* – there it was. Just one day later, I saw a fainter halo while walking to lunch…and noticed this rainbow-like sundog off to the right of the sun. I tried to take another shot with my sunglass lens in front of the phone, but fumbled it, and by the time I fixed the settings, it was gone. You don’t even have to be outside — a few weeks ago I posted a view through an office window. But you do have to look up once in a while! 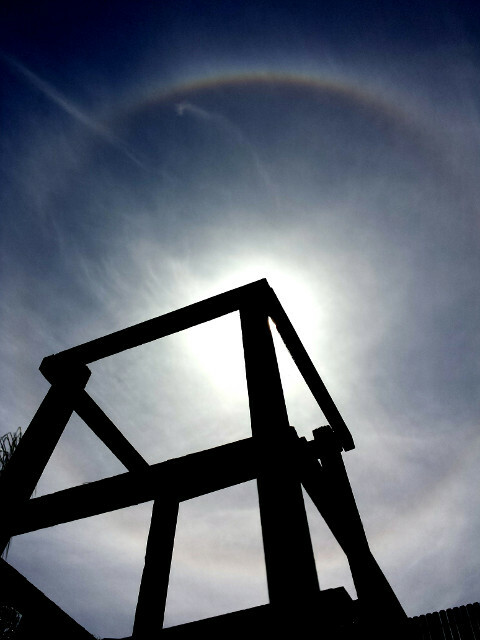 This entry was posted in Highlights, Photos and tagged halo, sky, sundogs on December 16, 2014 by Kelson. 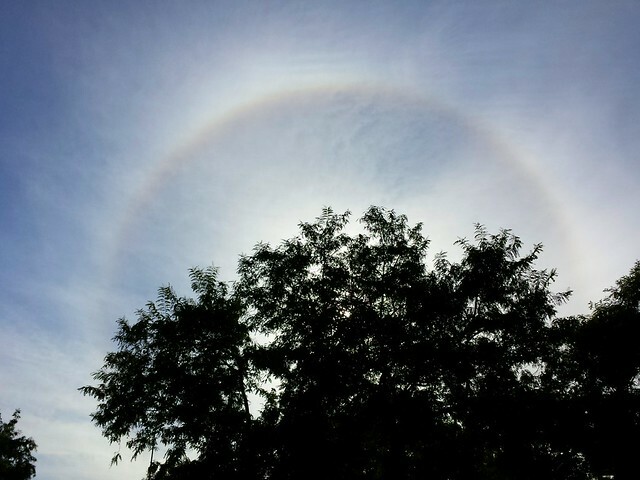 I spotted this great halo yesterday while we were out shopping for plants for a vegetable garden. The bright, colorful upper arc just jumped out, and while I searched for something I could use to block the sun for a photo, I also shaded my son’s eyes with my hand so he could look too. It was still visible 20 minutes later and a few miles away, when I noticed that the upper arc looked like it split to the left, probably a circular 22° halo with a circumscribed halo around it. That would touch the circle at the top, where it’s brightest, then branch off on tangents to the sides — and it does look like that may be going on even in this shot, on both sides, though I didn’t notice it at the time. 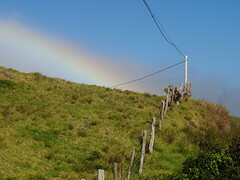 Halos like this are caused by reflections in ice crystals, but the ice can be in the upper atmosphere. 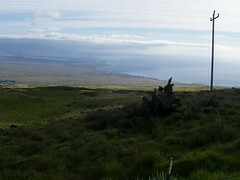 It was plenty warm down here on the ground, around 80°F. We did make it out to Mysterious Galaxy for California Bookstore Day (though they only had a few of the exclusives left by the time we arrived — apparently there was a massive rush that morning), but ended up missing Free Comic Book Day. It became clear while we were out running around that J wasn’t going to stand for waiting in line in the heat, and I never quite managed to get back out there myself after the rest of our errands were done. It didn’t really seem that urgent, two weeks after WonderCon (I still need to write that up, but you can check out my convention photos now). This entry was posted in Highlights, Photos and tagged California Bookstore Day, FCBD, halo, Mysterious Galaxy, sky on May 4, 2014 by Kelson. 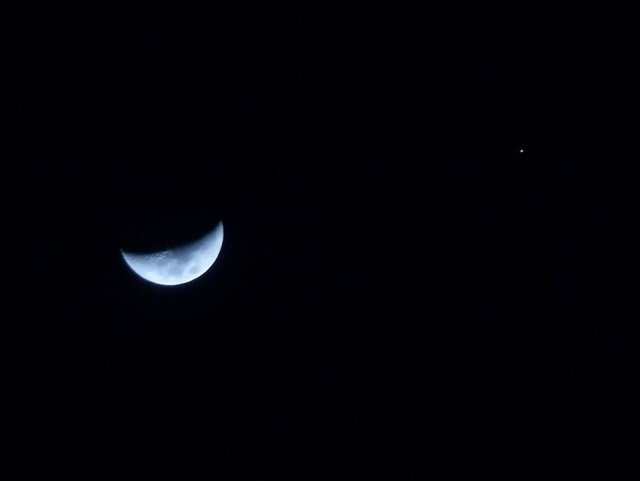 Yesterday I looked at the moon and Jupiter and thought, there’s going to be another conjunction tomorrow, isn’t there? Then I forgot, but fortunately I had to make a grocery run and looked up. For this second shot, I zoomed out and let it overexpose the moon so I could get the bright star Aldebaran in the photo as well. It was a bit easier than the really good one in January, because the crescent moon isn’t as bright (less area shining at us), so it didn’t overwhelm the stars and planet quite so thoroughly. As I post this, it’s been about half an hour, so if you’re in the western half of North America and the sky is clear, you can walk outside RIGHT NOW and see this! 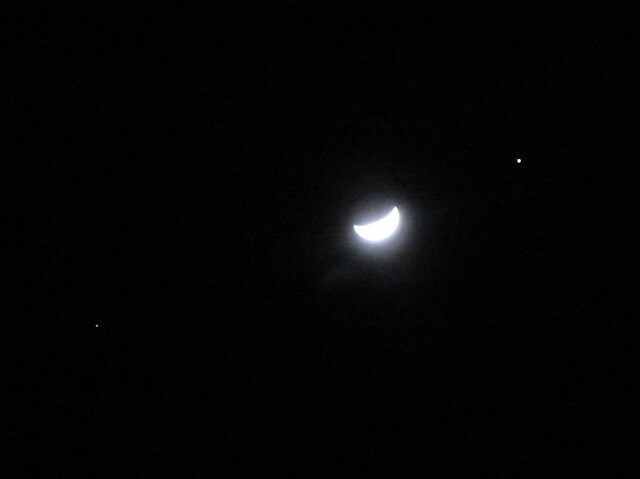 This entry was posted in Photos, Space and tagged Jupiter, moon, sky, Stargazing on March 17, 2013 by Kelson.